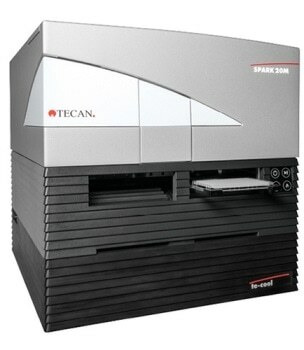 The new Spark 20M multimode microplate reader offers solutions to suit virtually any drug discovery or advanced research application. It features the latest generation QuadX Monochromators™, and the new Te-Cool™ cooling module uniquely allows the reader temperature to be set below ambient for more accurate and reliable results. An integrated microscope allows fast and precise cell counting and live cell imaging in microplates. These new options ensure there is a Spark 20M configuration to increase the productivity of your lab, both today and in the future. Automated microscopy enables live cell imaging and confluence measurement in parallel with quantitative readouts. A new monochromator, as part of the unique Fusion Optics, enables unparalleled sensitivity, speed and flexibility. Unique temperature management with active cooling guarantees more reliable results for your microplate-based assays. The essential QC tool set for verifying and documenting the functionality of Spark readers in a GLP / GMP environment. The Connect stacker allows walkaway batch processing.